Take turning to the next level with our beautiful new spiralling and texturing systems. Complete with different wheels and an ergonomic indexing tool, you have everything you need to apply stunning spirals and textures to your turnings, whether big or small. This versatile multi-use Hollowing System designed to give maximum flexibility and usability to wood turners. The Revolution can be configured in many different ways, allowing the woodturner the flexibility to configure the tool for almost any hollowing situation. 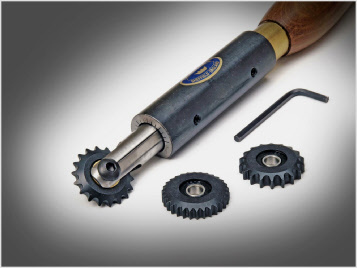 The interchangeable handle comes fitted with 5/8” and ½” collets as standard giving the turner access to a massive range of upgrade parts from the Crown Tools range.